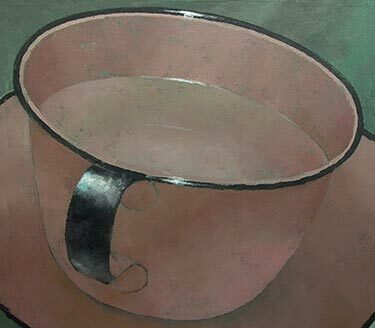 Over the past three decades of painting I've returned again and again to a variety of vessels as a subject for painting. It's not unusual in a painter's body of work to find this affection for everyday objects. An experience of vivid seeing often takes place as a surprise, frequently in the most ordinary moments with whatever objects are at hand. It might be an angle of light, a certain glow, or a chance arrangement of things. The paintings in this section are taken from some very different eras in my life. This can be seen in the different approaches or “styles” of painting. Also evident here is a practice of making variations on a theme – using a single object for exploring different color schemes or compositional arrangements. During the mid 1990s I experimented with a severely limited palette – alizarin crimson, phthalo blue, cadmium yellow light, burnt umber, and white, along with attempts to make very subtle changes in color and value. For all of the austerity of these limitations, the exercise was surprisingly liberating.